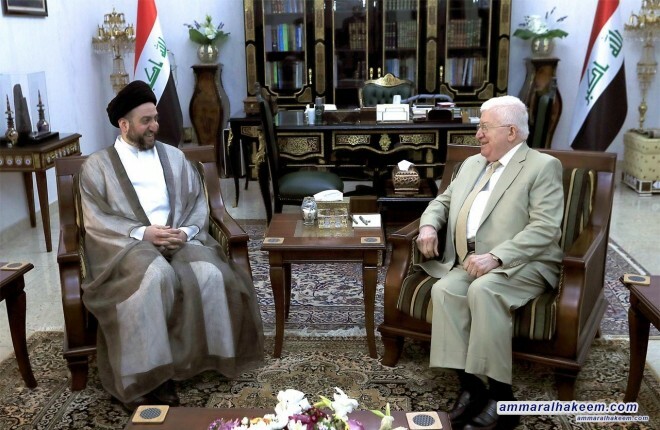 Head of the Al-Hikma National Movement, Sayyid Ammar al-Hakim, met with His Excellency Dr. Fuad Masum at the latter's office in Baghdad Thursday 23/8/2018. His eminence with his Excellency discussed forming the government and the necessity call the Iraqi House of Representatives to hold its first session and within the constitutional timeframes. His eminence reiterated his vision regarding the available options the government of national majority or the government of partnership through the national space and according to the terms set by the religious authority for the next phase. His eminence called on the political blocs to shoulder their responsibilities and read requirements next phase, stressed the need to form a strong, courageous, firm government that is able to provide services and achieve the aspirations of the Iraqi people.